00:00 blaise is there a command for it? 00:09 BakerPrime Who was that player that left a line of color stuff? 00:10 BakerPrime Nothing to do with any already known "spammers", right? I got a PM from them. 00:10 BakerPrime It was just a line of color, period. 00:11 blaise paramat: surely the lua in its original form would have rain or snow somewhere, right? 00:11 BakerPrime There was, someone was just very bad an HTML color codes. 00:29 blaise there was a guy that posted a youtube video that made a fork of your snowdrift, you know what ever happened to that? 00:30 blaise he didn't die, did he? 01:47 ProfanedBane Hey, random question. Do mods etc only run serverside? 01:47 ProfanedBane IE the client never downloads them or whatever. 01:50 ProfanedBane In theory all the mods licensed under LGPL can be modified, and the modified version can be kept closed source? 01:51 blaise I'm not an atturney..
01:51 ProfanedBane Was just confirming that, was checking what licenses to use for my code. 01:54 ProfanedBane So yeah, the can be closed source in the sense the source ain't distributed. 01:54 ProfanedBane Only AGPL keeps network/serverside stuff open source at all times. 01:54 ProfanedBane If I recall right. 06:22 rud0lf is there any advantage in using leveldb/postgresql map backend? 06:33 harrym 2 people with the same name? 10:42 pgimeno_ !tell ProfanedBane That's correct, the (L)GPL doesn't impose limits to code modification, only to distribution. Since the mods run on the server side and are not distributed, you may keep your changes private. 13:54 sameyepatch[m] just subscribed, so looking forward to more videos! 14:24 AndroBuilder is it possible to have a wildcard-whitelist? ... so anyone who has "R" or "r" in his name is allowed to join? 14:37 AndroBuilder IhrFussel: wow great thanks and where do i put this? 16:06 IhrFussel "if not" "and not"
21:54 blaise could someone log on to my server and tell me wha they thing is happening? 21:58 GNU[BDC] blaise: what server? 22:00 blaise are you evil? 22:01 blaise notice any funkyness? 22:03 GNU[BDC] blaise: did you press hide chat? i can see you repeat hello? 22:05 sfan5 blaise: you aren't running any chat modifying mods are you? 22:06 blaise sfan5: you think it's breaking my junk? 22:09 blaise I just now saw my hello? 22:09 blaise me or server? 22:09 GNU[BDC] blaise: looks as you have lag. 22:10 sfan5 which version is your client, blaise? 22:11 GNU[BDC] blaise: how many fps you get? 22:16 blaise don't have what? 22:16 blaise does the server seem playable and something someone might be able to enjoy? 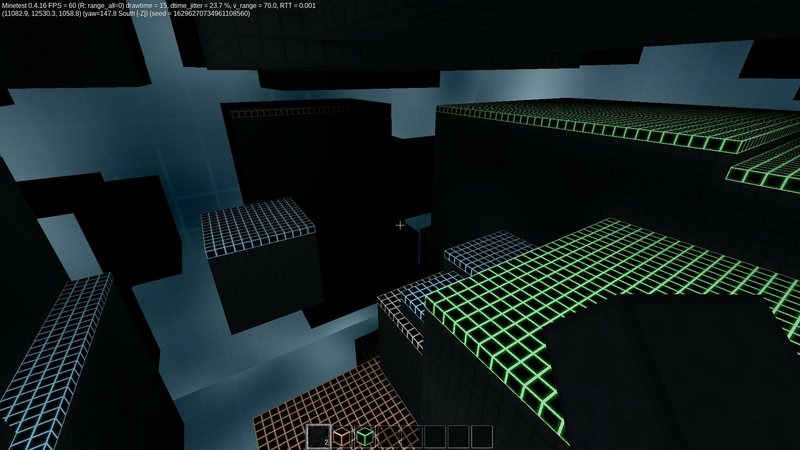 22:22 blaise sfan5: what is the spatial compiling option for in minetest? 22:31 blaise >---spatial? ( sci-libs/libspatialindex )"
22:36 MinetestBot ProfanedBane: Feb-05 10:42 UTC <pgimeno_> That's correct, the (L)GPL doesn't impose limits to code modification, only to distribution. Since the mods run on the server side and are not distributed, you may keep your changes private. 22:59 blaise why do people keep trying to supply empty passwords? 22:59 blaise do they think somehow that magicly no one will ever use the same nick or try to take their stuff? 23:01 blaise ident auth via ssl keys or something? 23:17 pgimeno_ try resetting it? 23:18 blaise how do I do that? 23:19 blaise "I command you gateways to fix my route!" 23:54 ProfanedBane Anyone know how expensive high precision 'line_of_sight" calls are?